Every once in a while, a couple comes along that asks us to do something totally different for their wedding. And we love it. We are obviously head over heels for a gorgeous, “normal” wedding, but we LOVE when we get asked to do something a little crazy! 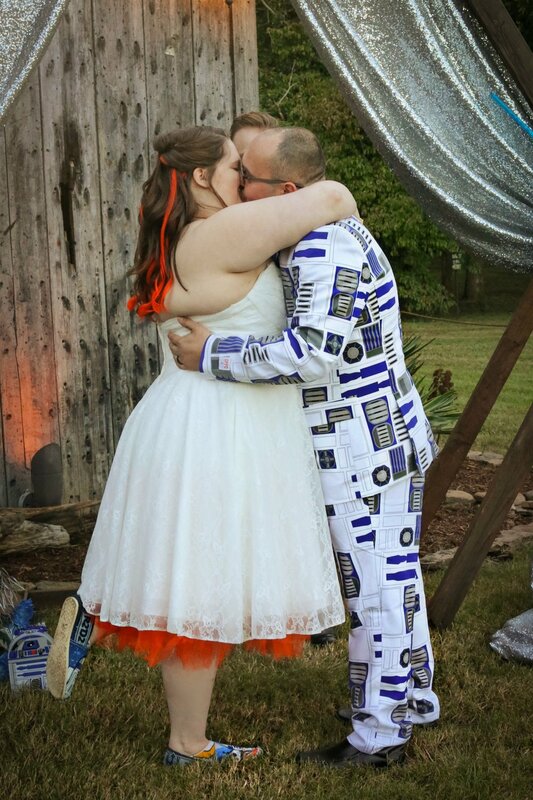 Whitley and Victor chose a Star Wars theme for their elopement, and they specifically chose R2-D2 and BB-8 as their inspiration. And it turned out AMAZING. There were lightsabers (duh), an R2-D2 suit (obviously), and a whole bunch of pretty blue and orange details! Our team managed to create a wedding that was fun and quirky, but also still totally gorgeous. We’ll always remember this one! Whitney from WDPhotography took their photos, and we love them! In a galaxy far, far away... Whitley and Victor were married at The Barn at Twin Oaks Ranch on October 18, 2018. Their colors were orange and blue, and their theme was Star Wars! “I was the BB-8 to his R2-D2,” Whitley said. LOVE! Whitley and Victor were our coolest couple of all time. Their outfits were SO good and fit their theme perfectly. Whitley wore a tea-length, strapless bridal gown with an orange petticoat underneath (inspired by BB-8, of course!). We very rarely see short wedding dresses, but they are so fun and perfect for a fun, lighthearted wedding! Victor wore the most epic R2-D2 suit. These two rocked their theme through every detail of their wedding, including their attire! Did we mention that Whitley even had orange streaks through her hair?! These two went all out. So dang awesome. Whitley had some of the brightest, most fun florals we’ve ever done, and we are crazy about these! “My favorite is sunflowers so there were those, as well as orange and blue flowers,” Whitley said. “Just a big colorful mix that was gorgeous.” There were pops of silver and loads of greenery, too… so, so pretty! Whitley said she and Victor “gave full reign to the team for the location of the ceremony on the property, the altar, and the cake.” Our team set up their ceremony off to the side of The Barn’s front doors (they were the first couple to tie the knot in this exact spot!). We used our hexagon altar with a silver glitter drape, orange and blue florals, and a whole bunch of lightsabers! 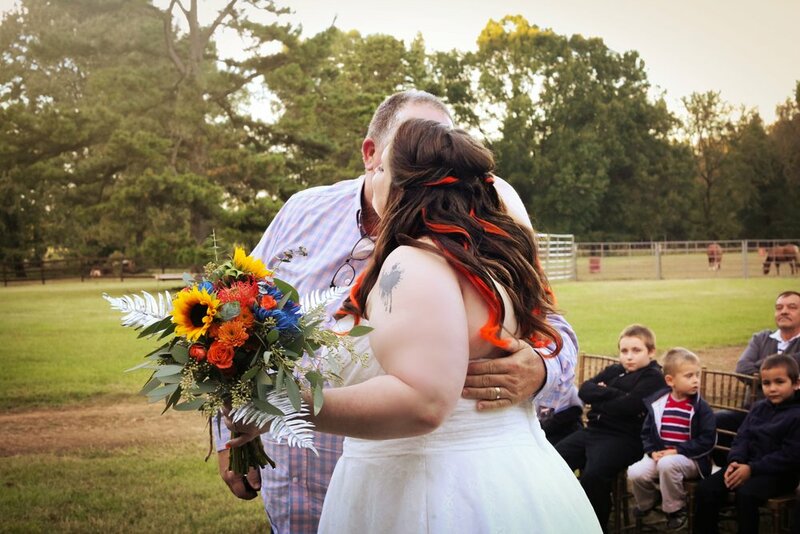 Their aisle was lined with small orange and blue floral arrangements in mason jars. Whitley and Victor asked some of their closest friends and family to participate in their ceremony, which made it extra special. Their friend Alahna Martin performed a song, and another friend, Ryan Swatzel, was ordained so he could be their officiant. They also had a fun, unique unity paint ceremony. As they walked back down the aisle as newlyweds, a few of their guests held up lightsabers, which made for the coolest grand exit ever! 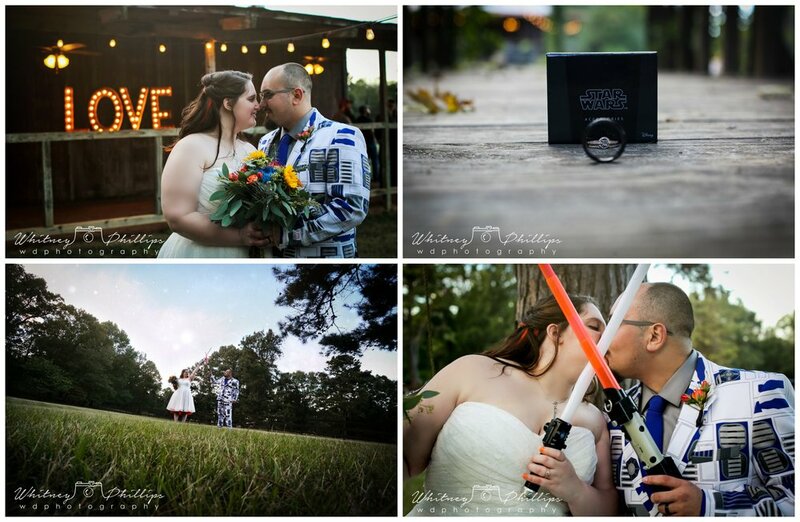 Whitley and Victor had a small, intimate reception full of Star Wars inspired details! “We had many Star Wars figurines and knickknacks that we had scattered throughout,” she said. “We had a Star Wars photo booth prop set up.” They also sent their guests home with several Star Wars themed favors, including decals, stickers and temporary tattoos. 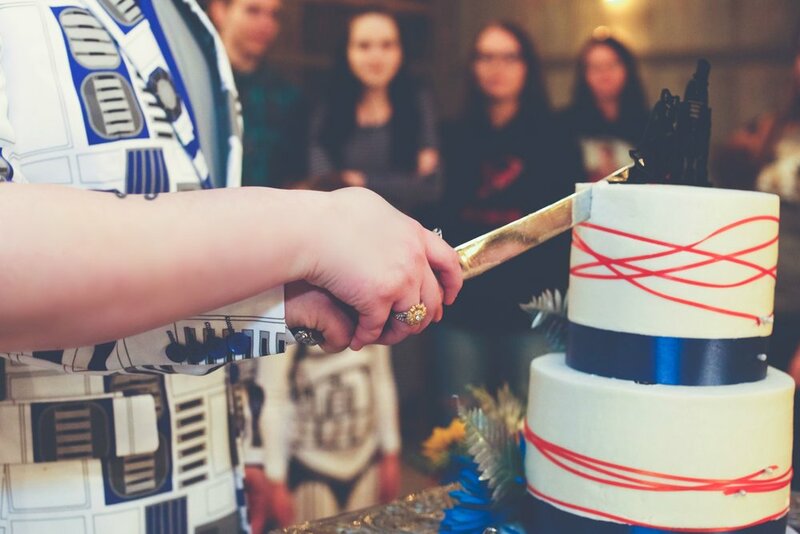 They had a simple white cake with orange and blue details and a Star Wars topper, of course!